Just when I thought I had found and catalogued all of Albert Decaris' early stamps, up pops an issue in which I had no idea he was involved. 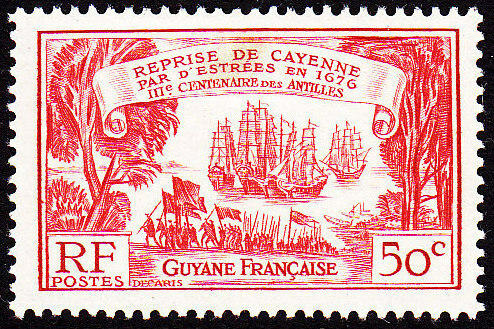 The issue in question was for French Guiana to commemorate the Tercentenary of the Founding of French Possessions in the West Indies (try saying that one three times fast!). 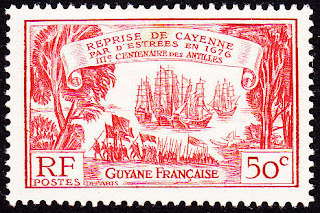 This issue comprises six stamps and it was released on 21 October 1935. There are two designs in this set, one of which was engraved by Albert Decaris. As you can well imagine, once I found out about this set I went online to try to source a copy for myself. Despite the fact that my Scott catalogue lists all three stamps for $14.75 US, I wasn't able to find the three at anywhere near that price. So I am going to have to purchase them individually. I have found all three, but so far I have only purchased one. So what does this design look like, I hear you ask? Below is an image of the one value I have purchased, the 50c value. There are two other values in this design: 40c and 1.50f.